Caherciveen is part of the Iveragh Peninsula, it is a region that is famous for its lush landscapes, miles of sandy beaches and peaceful rocky coves. A stroll around the local towns and regions will provide a true picture of Irish rural life where you can meet and view or sample many of the locally produced crafts and foods. There are lanes, roads and paths traversing the region including The Kerry Way and many places and structures dating back to early history including The Ring Fort of Ballycarbery and The Staigue Fort of Castlecove. Ballinskelligs is renowned for its miles of golden beaches (Blue Flag Award) and turquoise water. For sports lovers, Ballinskelligs, just off the Ring of Kerry, is an ideal location for your holiday, offering world class water sports from windsurfing to sea angling. 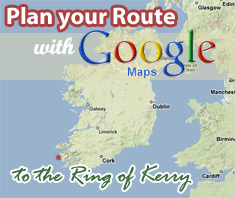 It is also an important departure point for boat trips to the Skelligs and for diving trips. Horse Riding in Ballinskelligs is very popular allowing you to experience the thrill of galloping along the sandy beach or go trekking in the mountains that surround the village. 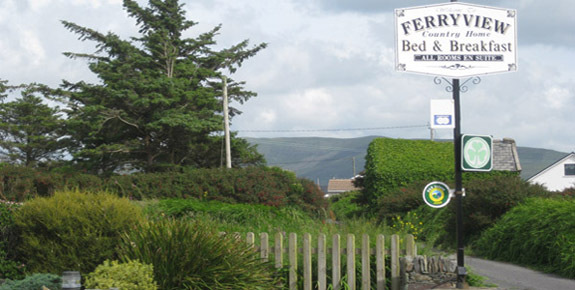 Ferryview country home is located within walking distance of the Valentia car ferry and visitors can easily walk to to an excellent seafood restaurant and pub. Ferryview is also within easy reach of the world famous Waterville Golf Club. Traditional music and dancing can be also enjoyed locally. Portmagee known as An Caladh in Irish is a village in the skellig region of Kerry. The village is located on the west coast of the Iveragh peninsula south of Valentia Island. Portmagee is a small picturesque fishing village with brightly painted houses. Locally the village is sometimes called "the ferry" referring to its purpose as a crossing point for boats to Valentia Island. Access to Valentia Island is now via a bridge from Portmagee. Portmagee is the main departure point for the boat tours to the Skellig Rocks, a UNESCO World Heritage Site. Waterville is one of the villages located on the main Ring of Kerry road, and is renowned for its beauty and charm and has been a favourite holiday destination of many visitors to Kerry. Waterville is sited on a narrow isthmus, with Lough Currane on the east side, and Ballinskelligs Bay on the west, and the Currane River connecting the two. Waterville has a myriad of attractions and activities to offer and you will find mountains & lakeland with the added advantage of the sea on your doorstep. Fishing in Waterville is very popular as the are caters for both salt and freshwater fishing. Waterville boasts two beautiful golf courses, one of which (Waterville Golf Links) is rated among the top 5 courses in Ireland and one of the top 20 links courses in the world. International top class golfers such as Tiger Woods, Mark O'Meara and Payne Stewart to mention but a few, have savoured the immense joy and challenge of this course. The small pretty villages of Caherdaniel and Castlecove are located on the Ring of Kerry between Waterville and Sneem. They stand on the shores of Derrynane Bay, an excellent location for angling, swimming and diving. Watersports in Derrynane are what the area is renowned for, as well as the steep cultural history of Caherdaniel. Located where the Kenmare river meets the Atlantic, the terrain varies from rugged shore lines to gently rolling mountains. Situated on the main Ring of Kerry Road, this area is renowned for its spectacular views of Dingle Bay and the Atlantic Ocean. Kells is an old fishing village and still continues in the fishing tradition to this day. The tranquil atmosphere and crystal clear water of the sheltered blue flag beach at Kells Bay has made it a family favourite for years during the summer months. Scenic walks from the village offer panoramic viewing points. Throught the wooded valley of kells, one approaches the beautiful wide open landscape of Foilmore. Situated on the Kerry Way, this area is a paradise for the hillwalker.